quarrygirl.com » Blog Archive » lunch at Vx vegan boutique in london! 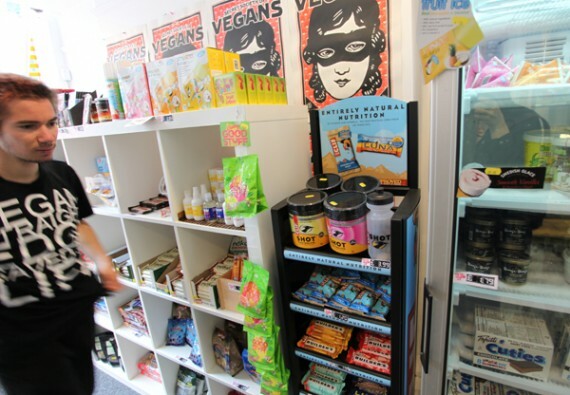 lunch at Vx vegan boutique in london! 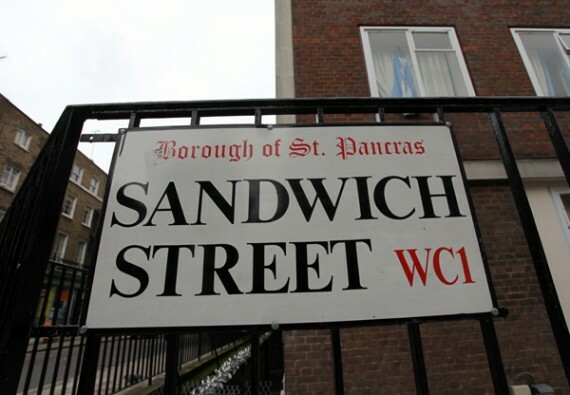 i’ve been wanting visit the Vx (pronounced “v cross”) in london ever since rachel reviewed it back in june. the entirely vegan boutique is just around the corner from st. pancras station and has everything from cupcakes and sandwiches to shoes and shirts, and it’s a must visit if you are ever in town. we checked out vx a couple months ago and while they had lots of cool clothes and other things for sale, of course our focus was the food. 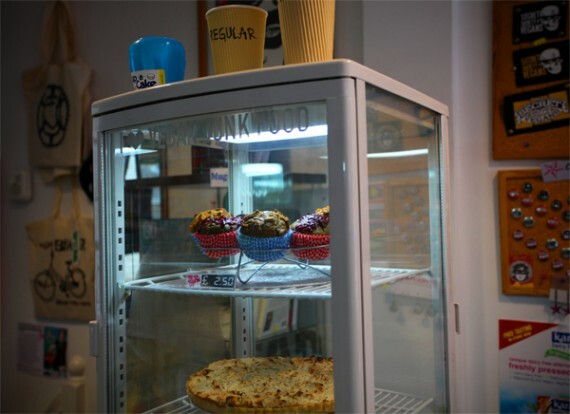 there was a well stocked fridge full of sandwiches, a case of pies and cupcakes, and an assortment of pastries…ALL VEGAN! i so wish we had a place like this in los angeles. we had a hard time deciding what to order, but went with a seitan pasty and mushroom pate sandwich by accidentally vegan. both were wonderful. 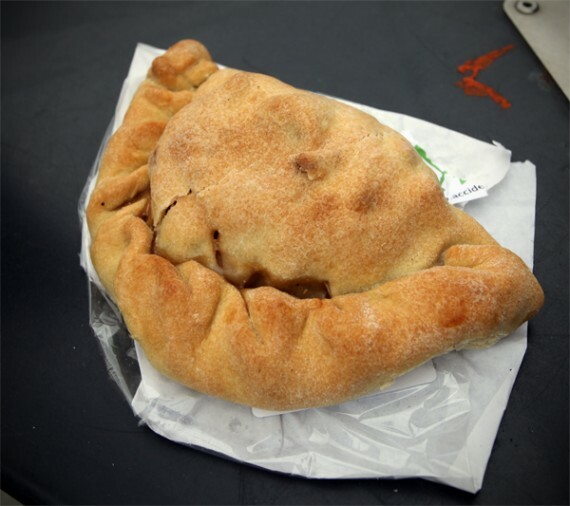 the pasty especially…it was filled with thick juicy wheat meat and winter vegetables, all wrapped up in a crumbly crust. i assume it would be even better heated up in the oven for a few minutes. 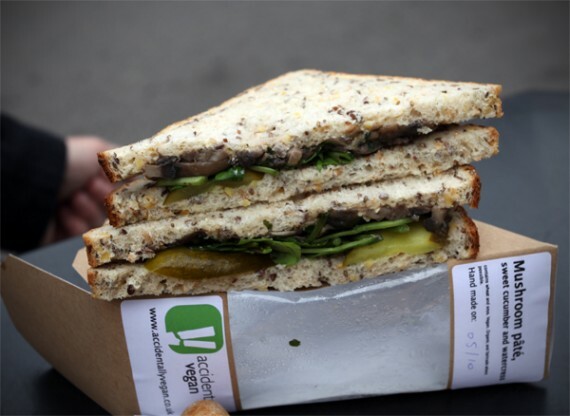 the sandwich was great as well: a really flavorful pate on good bread with loads of watercress and sweet cucumber. BE WARNED AMERICANS, sweet cucumber is a fancy term for “pickle”. so if you don’t like pickles, you are screwed! this made for a great little meal on the go (it didn’t taste like it should have been warmed up like the pasty did), and we even found the perfect place to eat it. I go to Vx at least once a week. The staff are so nice, and the range of goods changes regularly. I’d love them to become a global chain. There should be a Vx in every city and town. Paul and Vx- two reasons I need to be in London right now! I so wish they had something like this in Los Angeles!! actually, Vx has stuff that’s not available in LA. i really wish we had a shop like Vx. we have no exclusively vegan stores here. 🙁 there is a new vegan grocery store near LA, but it’s about an hour away in no traffic. Vx is already on my list of places to visit once I’m settled in London. QG and Mr. M – we should meet up at Vx when the stars align and we’re all in Jolly Ole! That’s slightly unfair. 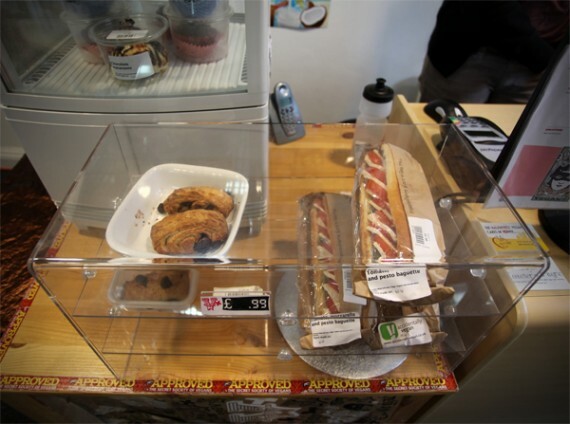 They stock Vegan Profiteroles, Eclairs, Mille Feuille, Croissants, Pain au Chocolat. They also stock Dog and Cat food amongst other things. That’s all exclusive to Vx. I’m sorry, but Vx is pretty special. Have you been to Vx?